Bush Morning Glory is a glowing presence in the garden. The soft, silvery foliage forms a perfect rounded mound that brings a strong architectural form to the landscape. The color looks amazing contrasted with bright flowers or dark-leaved plants. In late spring the plant is literally covered with white trumpet-shaped flowers that look similar to Morning Glory flowers. 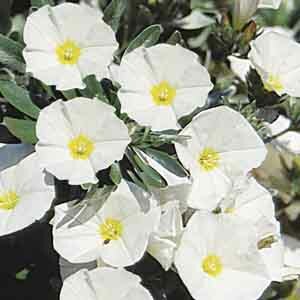 Incredibly carefree; this plant thrives in poor soil, heat, and dry conditions too. Creates a pivotal accent point in any garden. Excellent for borders, rock gardens, or mass plantings. Nice for larger patio containers. Tolerates poor soil, heat, and drought. Best if planted in gritty, sharply drained soil. Looks best with some summer water. Protect from excessive winter moisture.